Steve Michaelis - Senior Solutions Engineer; Workfront, Inc.
Agile has established itself as possibly the most effective set of management practices for organizations of all sizes to deliver high-quality, useful products on a much faster schedule. But although Agile allows business to be more responsive, flexible, and engaged, it is not the right fit for every project and every team. For many projects -- especially those requiring high levels of governance and compliance, or those producing physical product -- traditional gated methodologies such as Waterfall excel at bringing the required structure, repeatability, and predictability. 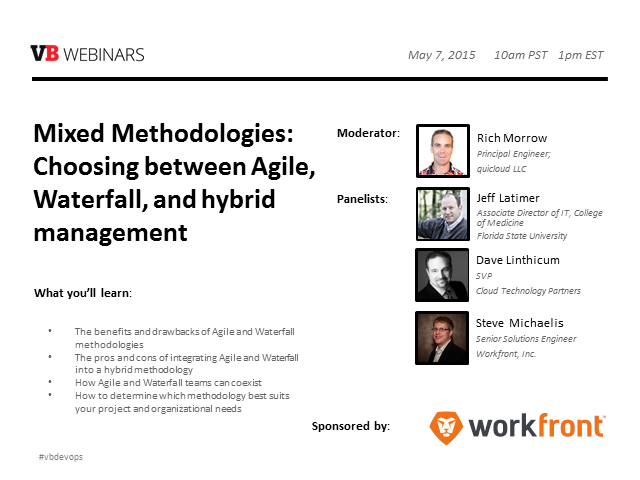 Join us to learn the benefits and drawbacks of agile and waterfall methodologies, the pros and cons of a hybrid strategy, how agile and waterfall teams can coexist, and how to determine which methodology to choose for your project and organization.